First things first. I owe you all an apology. Yesterday I was writing the premium report while at the same time getting ready for my weekly radio show. The radio show had technical difficulties and it took about an hour to iron them out. We finally did the show (1 hour late) and when it was complete I watched a little television and went to bed. I never realized that I failed to hit the publish button on the technical piece. I did not realize until late this morning that an article never went out. My sincere apologies. Second bit of news here before moving on to the subject you want to read about. I will be traveling tomorrow and will not be publishing an article on the action Thursday. I am leaving the computer behind on this trip, and getting away from it all for a few days. I will have my phone, so if something big happens I may try to post mobile. Okay. SiriusXM saw a nice recovery today, and I like the action. It did happen on lower volume. We are not out of the woods yet, but we are headed in the right direction. We will be getting positive news from the auto sector beginning Monday, so there is a lot to positive about. The biggest changes right now are in the support and resistance chart. The wall at $3.35 is already breaking down. This happens because the move today was bold. I have placed short term downside risk at $3.18, just below the 100 day EMA. There is strong support at $3.23. 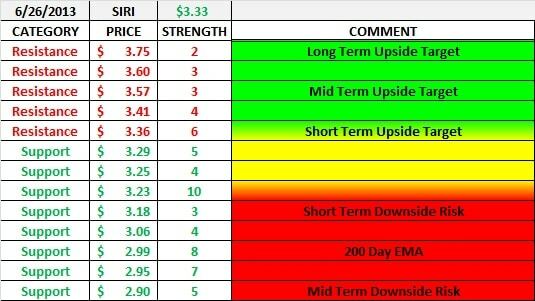 My short term upside target is $3.36 and not that far away is a mid term target at $3.57. The EMA's look very interesting. We removed ALL caution flags today. This equity is now poised to start taking down warning flags. The key is staying above $3.33. When is your weekly radio show, and how can one log in to listen? Typically on Tuesday nights. go to blog talk radio and type in playground radio.